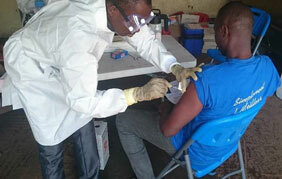 A vaccine against the Ebola virus, tested in West Africa for the first time in a field trial, has proved to be effective according to the first interim analysis published today in The Lancet. ISPM researchers were involved in designing and implementing the World Health Organization (WHO) «Ebola ça Suffit» vaccine trial. The Ebola virus disease epidemic in West Africa has not been defeated yet, although the number of cases has dropped substantially since the start of the year. Two vaccines that were recently developed have already undergone preliminary tests in humans. One of the vaccines, «rVSV-ZEBOV», has now been tested in the first large field trial of efficacy and effectiveness in Guinea, West Africa. Matthias Egger from the Institute of Social and Preventive Medicine at the University of Bern was heavily involved in this «Ebola ça suffit» trial, together with PD Dr. Sven Trelle and other staff from the Clinical Trials Unit CTU Bern at the University’s clinical study centre and Bern University Hospital. The initial results of the study s how that the vaccine can effectively contain the further spread of the Ebola virus. The results of the field study and the innovative study methods were just published in the «Lancet» and «BMJ». Efficacy and effectiveness of a rVSV-vectored vaccine expressing Ebola surface glycoprotein: interim results from the Guinea ring vaccination cluster-randomized trial. Lancet, 31.7.2015. Ebola ça Suffit Trial Consortium. BMJ, 27.7.2015.